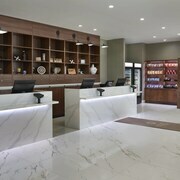 Where to find Bolton hotels near an airport? Where can I find hotels in Bolton that are near tourist attractions? Researching accommodation in Southern Ontario, particularly in Bolton? About 3 hotels are located within a 0.1-kilometre (0.1-mile) distance of the center of Bolton. 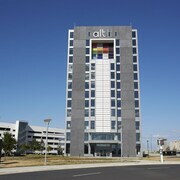 There are only a handful of hotels within easy walking distance of the center of Bolton. 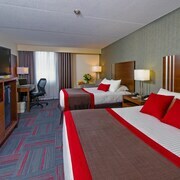 The Hampton Inn & Suites By Hilton Bolton is an ideal choice, as it is just 3 kilometres (2 miles) away. 30 kilometres (19 miles) away from the center of Bolton, is the Old Mill Toronto. 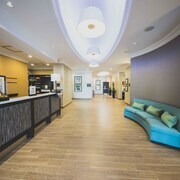 Alternatively, the Residence Inn by Marriott Toronto Vaughan is situated 19 kilometres (12 miles) away. 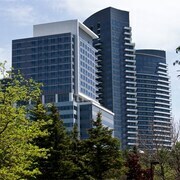 Two other Expedia-listed accommodations are the Sheraton Gateway Hotel In Toronto International Airport and the Homewood Suites by Hilton Toronto Vaughan. Why not spread your wings and visit the other sites to be found in Southern Ontario while you are in the area? Spend time at Southern Ontario's traditional villages. Lovers of the great outdoors can also make the time to to enjoy the region's beaches, coastal plains, forests and lakes. Popular pastimes in this part of Canada include skiing, cross-country skiing and snow shoeing. Vaughan is 15 kilometres (9 miles) to the east of Bolton, and is where you'll find the Vaughan Mills Mall and the National Golf Club of Canada. 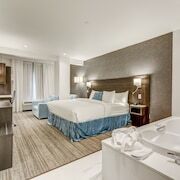 Should you wish to stay in Vaughan, be sure to check out the Courtyard by Marriott Toronto Vaughan and SpringHill Suites by Marriott Toronto Vaughan. 19 kilometres (12 miles) to the south of Bolton you'll find Brampton, which is home to the Courtyard by Marriott Toronto Brampton and The Marigold Hotel. While visiting Brampton, make sure you visit Wild Water Kingdom and the Rose Theatre. Mississauga is positioned 30 kilometres (19 miles) from Bolton. While you are in the region, be sure to check out the Playdium, Heartland Town Centre and the Living Arts Centre. You might also like to spend a little time at the Art Gallery of Mississauga and Mississauga Civic Centre. Should you wish to stay in Mississauga, be sure to check the latest deals at the Park Suites Mississauga - Skymark and Residence Inn by Marriott Toronto Mississauga/Meadowvale. Pearson International Airport is a logical airport for Bolton travelers, and is located 25 kilometres (16 miles) away from Bolton. Nearby accommodation options are Residence Inn by Marriott Toronto Airport and Homewood Suites by Hilton Toronto Airport Corporate Centre. What are the most popular Bolton hotels? Are there hotels in other cities near Bolton? What other types of accommodations are available in Bolton? Explore Bolton with Expedia.ca’s Travel Guides to find the best flights, cars, holiday packages and more!